More and more indications are coming from various sides that not just amongst people, but also amongst dogs, daily diet has an influence on behaviour. We often hear that following a change or adjustment of diet, dogs become more stable, happy, and evenly behaved. We also receive more and more reports from behaviour therapists that following a change of diet “the dog is suddenly much better”. We wish to make it clear that this is no coincidence, by referring to a number of facts connected with diet, in random order. No single organ is as varied in function as the liver. More than 500 processes are carried out at the same time and besides the many functions that are essential for life, detoxification of the body is possibly the most important process. Virtually all substances that have been taken up in the blood via the wall of the intestines eventually end up in the liver. The liver stores useful substances or processes them, and breaks down poisonous and excess substances. If too many poisonous and/or unnecessary substances are taken up as part of the daily diet, the liver remains constantly under too much strain with this (detoxification) function, and this threatens to put pressure on other important processes. Because the other important processes are essential for life it can happen that eventually a permanent situation arises of ‘too many poisons in the blood”, which literally cause a headache for the dog. Dogs also often have “a heavy head” because their liver is under strain. Liver strain can be caused by, amongst other things, too many substances in the food that are unnatural for the body, such as chemical antioxidants, colourings, aromas and flavourings, but also polymers and free fatty acids which are caused by extreme overheating of fats. All these substances have to be broken down by the liver. Liver strain can also be caused by too much protein in the food, in relation to energy content. Excess protein is broken down in the liver and converted into energy. The nitrogen that is released is transported to the kidneys via the blood in the form of urea. Our impression is that, often because of the production process, essential substances in the food become lost and/or are no longer sufficiently available. In our view this is, alongside strain on the liver, a factor relating to behaviour of dogs that must not be underestimated. In today’s most commonly applied dog food production method using extrusion, which results in crunchy, light pellets, the temperature increases to above 150°C. This high temperature is damaging for certain important ingredients. To give an example: many of the vitamins within the B complex are, in addition to being sensitive to light and to air, above all heat sensitive. And it is just these B vitamins that are important in relation to behaviour. Thiamine plays a role in the transfer of correct muscle coordination and maintaining the condition of the peripheral nervous system. The relationship between vitamin B-1 and behaviour is expressed mostly in behaviour factors that we recognise as hyper sensitivity and restlessness. Even a marginal lack of vitamin B1 causes (for example) a significant increase in hypersensitivity and restlessness amongst children. Alongside dietary and skin problems a slight shortage of vitamin B-3 can possibly cause nervous behaviour (amongst children nervousness and depression). Pantothenic acid encourages, in addition to normal growth, a healthy nervous system. It is required in converting choline into acetylcholine which is important for good brain function. A deficiency causes increased susceptibility to stress and faster mental tiredness. A deficiency also affects the repair of poorly divided cells. Pyridoxine is essential for a correctly functioning metabolism (amongst others in the liver). The substance plays a crucial role in the formation of serotonin and in this way the correct functioning of the brain as well as the nervous system. It has a large role in achieving balance between the two halves of the brain (in the absence of balance epilepsy can occur). A shortage can lead to all sorts of psychological complaints. It is important to know that pyridoxine (B-6) is the most heat sensitive of all the B vitamins. It is already lost at temperatures of 85-90 °C. Cobalamine is crucial for a healthy nervous system. Deficiency can lead to brain damage and disturbance of the nerves. If the (sensitive) B-6 is not present in sufficient quantities, this also disrupts the intake of B-12. This mineral plays an important role in many bodily processes such as provision of energy to the cells. It ensures electrical connectivity in the nervous system and supple muscles. Together with calcium it ensures good build up, growth and development of bones. Besides that magnesium also enables muscles to relax, and also the brain. Besides parenthesis/cramps, a feeling of distrust is one of the most important consequences of a lack of magnesium in the body. A shortage of magnesium causes a dog to be so cramped that he or she is not sufficiently in a position to listen or react to the surroundings. Nervousness also appears, and in many cases behaviour becomes unpredictable. Although in today’s dog food magnesium is mostly sufficiently available, a lack of it occurs more often than is generally assumed. Magnesium is an extremely difficult mineral for the intestines. Even if the intestinal flora is slightly disturbed, the absorption of magnesium is immediately compromised. Because 98% of magnesium is to be found in the muscles and only 2% in the blood, a deficiency is difficult to detect. A so-called ‘diagnostic’ change in diet gives the best result in order to detect whether a magnesium deficiency has a role to play in the (incorrect) behaviour of the dog. This is an essential trace element that is necessary for the normal functioning of the brain. It plays amongst other things, a role in activating enzymes that are necessary for the correct processing by the body of amongst others vitamin B1 (see above). Just like magnesium it is necessary in the case of manganese that the intestinal flora is in good condition, for it to be taken up in the body. Manganese is important in the formation of thyroxin, the most important hormone that is produced in the thyroid gland. Because manganese also has a great influence on muscle reflex a deficiency of it can cause apathy, listlessness, slow reactions and tiredness. Although there are many different factors which influence the behaviour of dogs, we have endeavoured to highlight a few dietary facts which do this. Besides the fact that a number of substances are made useless during the extrusion production process we see and experience also more and more often that shortages arise in the body because the intestinal flora is in a weak to bad condition. In scientific articles one reads more and more often that a good, varied, balanced intestinal flora is essential for the digestion of various substances. We also believe that the fact that more and more “easily digested” (not to confuse with highly digestible) dog food is on offer plays (in terms of its effect on the all-important good intestinal flora), a negative role on the health of dogs. The intestines become more ‘lazy’ because a lack of change means that there is limited intestinal flora necessary to process this easily digestible food. In addition we see that many valuable substances which are important for life are lost and/or become unavailable due to the high temperatures in the most commonly used extrusion process. The subsequent spraying of vitamins, including those of the B complex, on the pelletss, has little effect because most B vitamins in addition to being sensitive to heat, are also light and air sensitive. Ensure that your dog has a good, varied, balanced intestinal flora. This forms the basis of all, including mental, health. Give food that contains as few chemical substances as possible, to reduce strain on the liver. 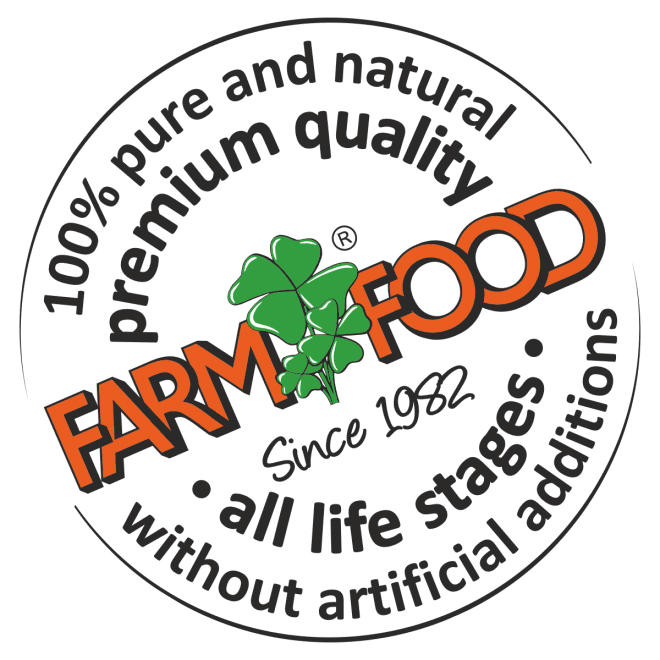 The Farm Food products contain no chemical substances. Give no food with a higher protein proportion than 25%. This is also applicable for puppies and young dogs, to prevent the liver, which is not yet fully developed, being put under strain. The protein proportion is the percentage of total energy that is gained from protein. You can read more about the protein proportion in our article “What requirements does good dog food have to meet?”. Give a good pressed pellet such as Farm Food HE. Because the temperature during pressing never exceeds 75°C you can be sure that all the necessary substances in the food are undamaged and still present. This is in contrast to extrusion, during which the food is subject to extreme heating in order to make it crunchy. If in doubt, use “diagnostic positive diet change” and discuss this both before and afterwards with your instructor or with your dog behaviour therapist (if you are following a course at a dog training school). Of course Farm Food HE is 100% based on this philosophy.